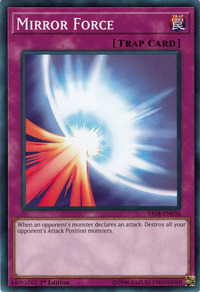 This card appears in the artworks of Trap Recycle, Photon Hurricane, E HERO Pit Boss, and the international and 2nd Japanese artworks of Exchange. This card was the first card released that could only be activated in response to an attack. Originally, this card also had an effect to negate attacks, being able to stop the attack of Total Defense Shogun and Elemental HERO Rampart Blaster. Its most recent errata states that it does not negate attacks; this is more than likely because of the fact that, while some monsters can attack from Defense Position, the monster triggering Mirror Force is more often than not in Attack Position (usually negating its attack by proxy). The 3rd Card appears on the poster of WRPG in 5D's. As of yet, this is the only trap card to appear in every Yu-Gi-Oh! anime series. Battle Fader: "Battle Fader" has a Trigger effect and must be activated as soon as the Trigger condition occurs. Battle Fader: The effect of "Battle Fader" is activated during the Battle Step and not the Damage Step, therefore you will be able to activate the effect of "Royal Oppression" to negate the Special Summon of "Battle Fader". "Battle Fader" has the same timing as cards like "Mirror Force", "Sakuretsu Armor", and "Magic Cylinder". This means you have one opportunity to activate it, the initial chain in direct response to the attack declaration. If you allow the current chain to resolve ("Battle Fader" > "Royal Oppression"), you will not be able to activate a 2nd copy of "Battle Fader". If a card like "Mirror Force" is activated in response to an attack, then "Negate Attack" can still be activated in chain. However, note that "Negate Attack" will resolve first, so cards like "Enchanted Javelin" or "Magical Arm Shield" will resolve without effect because the monster is no longer attacking. Cards like "Mirror Force" or "Widespread Ruin" which have the text, "Activate only when your opponent declares an attack." only have the attack declaration as activation conditions, so their effects will still be applied even if the attack is negated. If "Kunai with Chain" is activated and then a chained card negates the attack, then "Kunai with Chain" will still give +500 ATK, but the attacking monster will not be changed to Defense Position. : If "Magical Arm Shield" or "Enchanted Javelin" are activated in response to an attack, can "Negate Attack" be chained? You can activate "Morphtronic Forcefield" against "Mirror Force" if you control a face-up Attack Position "Morphtronic" monster. : Can "Morphtronic Barrier" be Chained to a card which does not target? If the effect of "Scrubbed Raid" is activated when a monster declares an attack, then the Battle Phase ends, so the attacking monster can no longer be treated as an "attacking monster". : If the effect of "Scrubbed Raid" is activated in Chain to the effect of "Sakuretsu Armor" or "Mirror Force", then is the monster destroyed? If the effect of "Scrubbed Raid" is activated in Chain to an effect like "Sakuretsu Armor" or "Dimensional Prison", then the effect of "Sakuretsu Armor" is not applied, and the attacking monster remains on the field. If the effect of "Scrubbed Raid" is activated in Chain to "Magic Cylinder", then the Battle Phase ends, so "Magic Cylinder" cannot negate the attack so the effect of inflicting damage equal to the monster's ATK is not applied. The effect of "Mirror Force" only destroys all monsters in Attack Position, so all Attack Position monsters will still be destroyed even if the effect of "Scrubbed Raid" ends the Battle Phase. Aurkus, Lightsworn Druid: "Aurkus, Lightsworn Druid" will NOT stop "Mirror Force" because these effects do not target. Book of Moon: If you are attacking, and you chain "Book of Moon" to your opponent's "Mirror Force" to flip one of your monsters face-down, that monster is not destroyed by "Mirror Force". Different Dimension Dragon: "Different Dimension Dragon" cannot be destroyed by "Fissure", "Mirror Force", etc. Also, if "Different Dimension Dragon" is your only monster on your side of the field, your opponent cannot activate effects like"Mirror Force"
Dramatic Rescue: You can activate "Dramatic Rescue" when an Amazoness on your side of the field is targetedbut not when cards like"Mirror Force"are used. Elemental HERO Wildheart: If you attack with “Elemental Hero Wildheart” and the opponent activates “Widespread Ruin”, if “Elemental Hero Wildheart” is your monster with the highest ATK, no monster will be destroyed by the effect of “Widespread Ruin”. If the opponent activates “Mirror Force”, “Elemental Hero Wildheart” will not be destroyed, but all your other Attack Position monsters will be destroyed. If the opponent activates “Negate Attack”, his attack will not be negated, and the Battle Phase will not end. If the opponent activates “Magic Cylinder”, his attack will not be negated and no Effect Damage will be dealt. Fiend Skull Dragon: Cards such as"Mirror Force"will all apply their effects to "Fiend Skull Dragon" because these cards do not target. Lord of D.: "Lord of D." will NOT stop"Mirror Force"nor will he protect your Dragon-Type monsters from their effects, since these cards affect the whole field and do not select targets. Metalsilver Armor: Your opponent cannot activate "Monster Reborn" and other cards that target while you have a monster equipped with "Metalsilver Armor". Your opponent can activate"Mirror Force"
My Body as a Shield: "My Body as a Shield" will negate"Mirror Force"
Prime Material Dragon: "Prime Material Dragon's" second effect works like "My Body as a Shield". "Prime Material Dragon" can negate cards such as "Mirror Force"
The Six Samurai: You cannot destroy a “Six Samurai” monster to save more than one other “Six Samurai” monster at the same time. Example: You control “Yariza” in Defense Position and “Nisashi” and “Irou” in Attack Position. “Mirror Force” is activated when you attack with “Nisashi”. You can destroy “Yariza” to save “Nisashi”, or destroy “Yariza” to save “Irou”. You cannot destroy “Yariza” to save both “Nisashi” and “Irou” at the same time. Six Samurai: A “Six Samurai” monster that is in the process of being destroyed cannot be destroyed to save another “Six Samurai” monster. For example, if you control “Yariza”, “Nisashi”, and “Irou” all in Attack Position, and your opponent activates “Mirror Force”, you cannot destroy any of those 3 instead of another. The Dragon's Bead: You can only activate the effect of this card to negate a Trap Card that targets a face-up Dragon-Type monster, so it cannot negate "Mirror Force"
Total Defense Shogun: "Mirror Force" cannot destroy "Total Defense Shogun" if he attacks while in Defense Position, and his attack resolves as normal. Total Defense Shogun: If "Total Defense Shogun" in Defense Position is your only monster, and attacks, your opponent cannot activate "Mirror Force" because it will have no effect. Tyrant Dragon: When you attack with "Tyrant Dragon" the opponent can activate "Mirror Force" and all your Attack Position monsters, including "Tyrant Dragon", will be destroyed. This is because "Mirror Force" does not target.